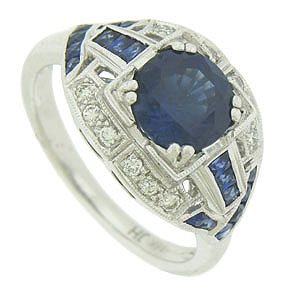 A dramatic 1.77 carat, round cut sapphire is set into the face of this elegant 18K white gold engagement ring. 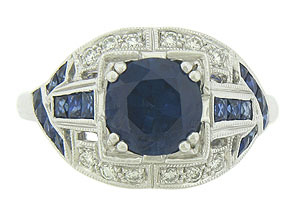 Rows of square cut sapphires and round cut diamonds adorn the surface of the antique style ring. 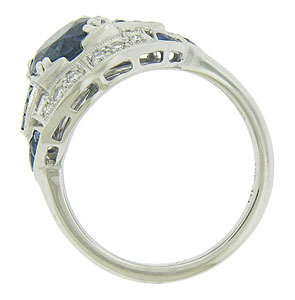 The ring is set with approximately .56 carats of square cut sapphires and measures 11.84 mm in width. 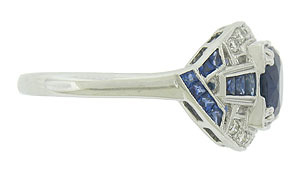 Size 6 1/4. We can re-size.